My only complaint is the lining of the pockets gives me static. It probably won't affect most. Best jacket I've ever owned! I love it! So comfortable and I wear it everyday! Warmest jacket I’ve owned. Been hours in freezing temps and this jacket did really well. Works so well I will be using it as my snowboarding jacket next time I go. Jacket is not heavy at all yet stays so warm. Fits perfect with or without sweater underneath. Has plenty of pockets for inside and outside of jacket with zippers on pockets. Like jacket. Good length on arms. Wish would have gotten the tall size. Seem little short.as for fit I won’t comment because everyone is different. Fit to size.. Holding up good at the time can’t wait to wear it more. This is the most comfortable and hard working Carhartt jacket I own. I was concerned that it wasn't going to be warm enough in the middle of winter, but I was surprised that I found myself taking it off because I was so warm. This is a must have for anyone who works outside and needs a dependable jacket. Great Jacket. I highly recommend it! Jacket runs Large. My company bought this jacket for me and I absolutely love it!. I was not a big fan of Carhartt jackets because the material that they use to me it looked uncomfortable and stiff. Also, the material in normal Carhart jackets look like work jackets This jacket completely changed my mind about Carhartt and not only is it a great work jacket but it doesn't look like a work jacket. It is very comfortable, flexible and extremely warm. I can wear it in 15°F weather with only a t-shirt underneath and stay warm. I have to take off my other jacket made for cold weather as soon as I go indoors because I will start to sweat where as this doesn't happen wearing the Carhartt. I highly recommend buying this jacket. I am normally on the border between Large and XL. In other brands large jacket will be tight on me if I'm wearing anything other than a T-shirt underneath. In other brands Xl fits me perfect if I'm wearing multiple layers. The Carhartt XL is little big on me, I could have gotten away ordering the Large. Nice jacket. Fits well. Not too heavy. Its repels water well. Overall, another great carhartt jacket! 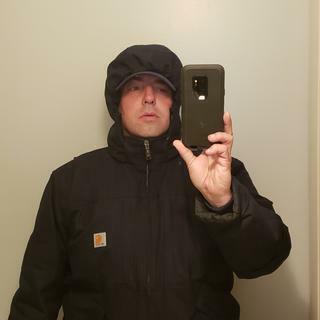 Fits great, good alternative to the normal heavy brown carhartt coats. Good warmth. This is the best working coat I've ever owned (I'm 63). Tough, warm, and allows almost total freedom of movement for the shoulders, arms, and upper body. The only slight criticism I would have is that special attention must be paid to seating the zipper properly before zipping up. Also, pay attention to the size of the model that has the Medium coat on. I had to send the Medium back for a Small, which fit perfectly. Overall a great coat. Great design, overall one of the better jackets produced. It's not quite as solid as the original duck so I am still skeptical on durability, but comfort and flexibility it stand alone at the top. NOT ONLY IS THIS JACKET WARM AND GOOD LOOKING BUT IT IS COMFORTABLE TOO. I WILL ONLY BUY CARHARTT CLOTHING. IT'S DURABLE, PRACTICAL, AND JUST GREAT TO WEAR. Very comfortable to wear. Moves with you. Plenty of pockets. I like being able to remove the hood. It would be nice if Carhartt offered this in black. When you pull the draw string to stop the wind from blowing up your back, it just hangs out in space. Not only does that stupid string snag on door knobs, seatbelt buckle when you’re trying to stuff the buckle in the latch and every darn thing you walk past… 3 time’s it’s caught and pulled my EDC knife out of my pocket. Oh yeah, and it looks STUPID hanging out, looking unprofessional. 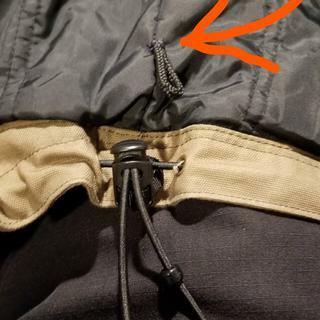 In an effort to help you create and build a better product I sewed in a loop to hold the draw string inside the jacket. I’m sure you’d install a little snap retainer or something better, but this is all I got. We appreciate your input and have shared it with our Product Design department. Super comfortable and easy to move in! Extremely warm and love the versatility! Excellent jacket. Very warm, sleeves are slightly on the long side but a great purchase. We got this jacket for our employees who is out on build sites but also meets with a large variety of people. It looks good for all occasions and keeps him warm and dry. Now everyone wants one! Husband loves this coat. Bought it for him since he was the only one in the family without a Carhartt coat. Loves how warm it is and the full swing motion of the coat. Color is awesome too...bought the brown/tan color. Husband is 6'1'' and 202 lbs. It fits him perfectly. A little extra room to wear layer underneath for the cold weather. Ordered this coat for my son. He moved from Florida to Texas and the weather is much different. He love the comfort, warmth and flexibility to move while wearing this coat. Very pleased! Great jacket. Performs just the way as explained. Buy 2 of those in the same week ... and I would buy one more if the black color was available???? Great jacket, lightweight very easy to move in and comfortable. Good insulation, I'm cold natured and with the wind blowing at 30 degrees I was still reasonably warm. Great jacket lots of movement unlike other carhartt jackets I've had before. Really warm and great in the rain. The double zipper takes a little getting used to. Perfect jacket for anyone! Stylish, weekend warrior, or everyday outdoorsman. Just bought this a few days ago, I’ve never owned a carhartt before but glad I went into the store! The employee was extremely helpful, she went beyond what most employees do when asked and I never had to ask for anything! 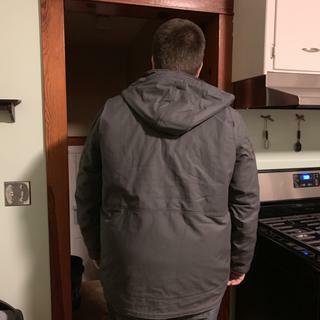 Back to the jacket, I am 6ft 280lbs so I went with the 2XLT and love the length! It doesn’t come up when I bend over and the front is just long enough to not ride up when reaching for something high.. MY ONLY COMPLAINT....the sleeves are just a little to long, I get that they made them long on purpose but a little shorter and it would be 5 stars. I roll the cuff up once and it helps but wish I didn’t have too! It is very warm, I would say it’s definitely on the heavier side (actual weight) but it doesn’t feel it when it’s on. I can move with freedom and don’t have to worry about the sleeves riding up or it being tight on my back. This was a great idea and glad I got it. I would definitely recommend purchasing this jacket! I love the coat. I have gotten several compliments on the coat. I manage a wholesale nursery and and lifting trees and bending over quite often and it does great. I really like the range of motion and comfort in the coat. It's probably the best coat I've ever purchased. It is versatile and Carhartt has thought of everything. Drawstrings at the bottom and around hood if you need it, but not if you don't. Lots of pockets. If I had one complaint as an honest review, I'd say the hood is too large and hangs over my eyes. I have to wear a ball cap with a brim to keep it up so I can see. And I'm a big guy at 6'2" and used to looking down a bit but can't look straight ahead. I wish you had a gusset snap or something that could adjust the length of the hood or that it was just smaller. Maybe it is by design for wearing over hardhats. If so, I wish we had a size option. I never wear hardhats. Other than that, it would be perfect. We will gladly share your input with Product Design. -- The length (I'm 6' 0" and went with the regular length) plus non-elastic waist I find comfortable and non-restrictive. That said, it has elastic draw strings on the bottom hem so you can cinch it in if you want (probably not something I'll use and if you like a cinched bottom, a jacket with an elastic bottom hem probably makes more sense). -- Removable hood. This will be my "heaviest" jacket for the winter (admittedly not a super warm jacket, but still pretty darn warm--I like to do layers, so can up the warmth with a vest/fleece underneath when needed) but I've removed the hood anyways. I rarely use a hood, preferring those flat around the back ear muff things if really cold. But I like having the option of putting the hood back on if I know I'm going to be doing something outdoors for a long time in very cold weather. -- I like the material, the jacket doesn't feel heavy at all on me yet is warm, and is water repellent. -- Hand pockets with snap closure. Pocket closure wasn't essential but I like it (less worried about losing a glove as I often take my jacket off on my commute) and I'm much happier with snap over the zipper hand pocket closures that my old Carhartt jacket has --I worried with that old jacket that the zippers would do a number on my watch's face when I put my hand into the pocket. -- The full swing design is supposed to give a lot of freedom of movement in the arms. I think it lives up to the claim nicely. -- Smooth chest areas. There are two handy vertical zipper pockets very close to the center zipper that don't get in the way of a shotgun buttstock (I wear this when out shooting). My older Carhartt jacket has breast pockets with horizontal snap closure flaps; not great when raising your shotgun to your shoulder to aim and fire. -- DOES NOT HAVE A ZIPPER FLAP WITH VELCRO CLOSURES. (Doesn't have a zipper flap at all, which is fine). I will not buy a jacket that has a flap over the zipper that has velcro closures. The velcro snags on things, gets threads and fluff stuck in it so looks awful, and you have to listen to velcro every time you take off your jacket. Listen up jacket/coat designers: If there's a flap, snaps are fine. Buttons, ok. Never velcro! -- Color. My older Carhartt is black and tends to readily show animal hair and lint. Plus the black seemed to show wear quicker as the black became "not quite" black in some areas relatively quickly and also seems to show ring around the collar more quickly. I got the shadow (grey) color, which appears to be faring better with all of the foregoing. I also will note it has a double pull zipper, meaning the kind where the top pull closes the zipper and then if you want you can pull up the bottom pull to start unzipping some from the bottom. I wasn't looking for that feature when shopping, but turns out I like it as I can unzip the bottom a few inches to make wearing the jacket zipped in a vehicle while driving more comfortable. Excellent jacket, a little short I would prefer it a bit longer. Yes there is a tall, but then the sleeves would be too long. I accidently ordered the wrong jacket. Wanted the Sherpa jacket-not the Cryder Jacket. Didn't like the material. Arms were way too long. Returned it. I am overall happy with the jacket with just a couple of small complaints. Both have to do with sizing/cut of jacket. The sleeves are just a bit too long and the front waist of the jacket is too short. Both by about 1 inch. These two combined throw the jacket out of balance to my eye.That being said, I'm happy with it and would buy again. Only had it for 10 days so not sure about durability but it fits nicely and lets you move freely. I am 6 ft 4" and 250 and I bought a 2xl tall which fits great(doesn't drown me). Also its quite warm and looks good. All you can ask for in a work jacket. At first I was skeptical on the full swing part. But after use I am a believer. This is my first Carhartt jacket and love this brand. First of many for sure. Great coat!!! Very flexible and comfortable. The extra pockets are convenient. Only wish I could have purchased in black. It is truly an all around GREAT jacket! It’s exceeded my expectations... Carhartt is an AMAZINGLY DURABLE Brand that will concore any task you can put it through! Got this coat a few weeks ago and I've been loving it. I live in Wisconsin and we just had three days of 20 below temperatures and with a long underwear shirt and a long sleeve t-shirt I was comfortable. When shoveling I am plenty warm and there are no restrictions in movement. It was a little hard to spend the money but I think in the long run it will be worth it. Why isn’t their a 3xl tall? BEST ANSWER: Unfortunately, we do not make this size in this style at this time, we appreciate your feedback and will forward your suggestion to our Product Design Team for future consideration. how do you work the double zipper? I can't seem to unzip the jacket completely? BEST ANSWER: You will want to align both sliders on the zipper track. Then, pull the bottom slider down first. This should allow you to pull the other down as well. Please contact us at 1 800 833 3118 with any further questions. BEST ANSWER: Yes, two of them, one on each side. The left one has a zippered closure just inside the lapel That opens vertically, like the 2 chest pockets kn the outside. The one on the right You have to reach inside a bit farther and has a small square Velcro closure that opens horizontally. yes, very nice jacket, extremely warm. I ordered a 2xl tall I could have just gotten a 1xl Tall the sleeves and the tail of the jacket are plenty long enough. Yes, two inside pockets. The left inside pocket is zippered and the right side uses a Velcro closure. Yes. One pocket on each side. One pocket has a zipper and one pocket has Velcro. Yes there are two inner pockets, I highly recommend this product. Can I return a jacket from the website to a Carhartt store? BEST ANSWER: Yes, a Carhartt Company store can help with your return. How to remove axle grease from coat? BEST ANSWER: You may wish to try a little Dawn dish soap and then launder per the care instructions. How do I know which size to get? I am 5'4 and 120 pound female and I tried on the small but it was too small in the waist for me, do you think that the medium would be way too large on me? Is there a timeline to offer this in black? BEST ANSWER: We will be coming out with Black this Fall. What are the sleeve lengths? Hope black is coming soon! Is there a hood to jacket? BEST ANSWER: This jacket will come with a detachable hood. How much longer is the arm length on the talls? BEST ANSWER: Tall size will add 2 inches to the arm and body length. When will the large in shadow be available again? BEST ANSWER: This color will be back in stock by the end of this year. Is the front length of the coat considered a waist, hip or thigh? Is the hood sold separately? BEST ANSWER: This item does come with a hood. The length depends on how tall you are and/or the length of your torso. Feel free to contact us at 1 800 833 3118 for further assistance. What product should I use to replenish the water repellence? BEST ANSWER: You can treat this item with Scotchgard or Nikwax as long as it is labeled as safe for the fabric. How does the 3M™ Thinsulate™ Insulation compare to say the the Artic quilt or Sherpa or blanket lining? BEST ANSWER: Our Arctic insulation will be the warmest, the the 3M Thinsulate. The Sherpa lining will be a in our warmer category and the Blanket will be in our warm category. Can you buy the hood separately? How warm is this coat? I’d say the average temp by me is 15 degrees in winter, will this coat keep me warm? BEST ANSWER: Yes it’s the best coat I have ever purchased. I hope to get 10 years out of it! I can't say enough about this jacket. It's great. Where I am from, it averages 14 degrees and it suits me just fine. If you are out for longer periods of time and the temp dips below 13 degrees, you may want a carhartt sweatshirt underneath, but that all depends on your tolerance and level of activity. If you are a flagger on a job site, you may want the sweatshirt. If you are the foreman, standing by sipping a cup o joe, you may want the sweatshirt. If you are the breakneck, hammer swinging, jackhammer riding Bulldawg that all the ladies fawn at while driving past going 15 mph through a work zone hoping to see beads of sweat condensate off that full head of hair, you may want to forego the sweatshirt. Regardless, the decision to wear extra garments should be a much harder one than the decision to buy this jacket, because this jacket is the undisputed heavyweight champion in a world full of lightweights. Cheers! This coat is extremely warm. Almost too warm, until it breaks freezing. It is not as thick as a normal Carhartt, so it can be deceiving. If you are working in this coat, which I would assume you are (although it does look great with jeans too), this coat will keep you warm with wind chills well below zero. Great investment. Worth every penny. Yes. I wore this last year through a blustering Windy City winter. I recommend wearing an extra layer, with proper gloves/hat/scarf on the coldest days. It's really freaking warm. It keeps the wind out too. I've warn it in mid twenties weather thirty feet in the air with the wind howling and I was warm. I find this coat quite warm. If you are active in 15 deg. I think you would be warm enough however if just standing around you might need a vest also. Yes it will keep you warm at that temp. I wear it all the time. I believe it will. Of course you will still need to layer some. I’m usually a xl but i have broad shoulders should i do a xl or xl tall? BEST ANSWER: Order a tall will only change the sleeve and body length (not the width). Please contact us with your chest and waist measurements for further assistance. I am 5’8” and about 160, what size should I go with? BEST ANSWER: We would recommend going with your chest measurement and following our size and fit guide. Please contact our Customer Service Department for further sizing assistance. how many ounces is this coat? BEST ANSWER: This style will be an 8.25 oz cotton blend Quick Duck fabric. BEST ANSWER: We would recommend going by your chest measurement and following the size and fit guide. If you need additional assistance with sizing or product measurements please contact our Customer Service Department at 1-800-833-3118. How wind resistant Is this jacket? It’s pretty good in the wind. I would say a 9 out of 10. It's excellent in the wind! Will this coat ever be offered in black? Will they ever sell this in Blue? That's our company color and I can't buy this if it isn't. Sleeves seem to run a little long. Is this intentional as part of the style? BEST ANSWER: The length of the sleeve is part of the of the storm cuffs to help eliminate the elements from coming up the sleeve. is the hood the same material as the coat? BEST ANSWER: Yes, it will be. BEST ANSWER: No, we do not recommend any of our products for welding. What is the measurement of the inner rib knit cuff? The Yukon Extremes Arctic Quilt-lined jacket has a very short inner rib knit cuff that also fits loosely. BEST ANSWER: The inner rib knit cuff is 2 1/2 inches long. It is the same length as the Yukon Extremes Arctic Quilt-Lined Jacket. Does it fit loosely or close to body? BEST ANSWER: Enter an answer to this question.I’m 175lbs with an athletic body type. I bought a medium and it fits perfectly. Good enough to move around and work. But looks good and form fitting for going out into town. I’m 175lbs with an athletic body type. I bought a medium and it fits perfectly. Good enough to move around and work. But looks good and form fitting for going out into town. 180 pounds. Also bought the medium. Full swing allows you to reach above your head without the jacket riding up above your waist. Not bulky at all. 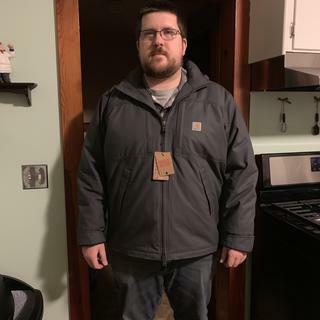 I would say the fit is perfect, not too loose, like previous carhartt jackets I've owned, not too tight were I can't move. It's roomy enough to layer under but still feels comfortable and looks good. Is this jacket both machine washable and machine dryable? I really always need to machine wash my jackets and not take them to the dry cleaners. I do not like to have my clothes dry cleaned because of the chemicals they use.. Thank you.